Nebraska Lake Management provides a wide range of services and is your source for lake management solutions and assistance. From phone consultations to on-site management, our aquatic biologists can help you find the right solution for your lake or pond. Our services include biological lake surveys, water quality surveys, lake renovations, rough fish removals, installation of aeration systems, chemical treatments, fish stocking, and nutrient and algae monitoring. With every product and service offered by Nebraska Lake Management comes an unyielding committment to customer service! Please contact us with your lake management problem and find out why Nebraska Lake Management is Your Lake Solution! Biological and Limnological Lake Surveys: Includes depth survey, water temperature and dissolved oxygen profiles and a detailed fish survey using electrofishing. Detailed water testing can also be provided for an additional fee. Consulting with lake owners on how to improve the quality of fish and water resources in their lake is the goal of our Lake Surveys. 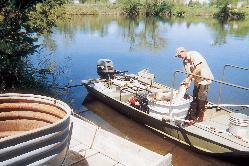 Rough Fish Removal: For many lake owners, selective removal of shad, carp, buffalo, carpsuckers, white perch and other undesirable species using our electrofishing boat is the only feasible option for controlling these unwanted fish. Rough fish removals are designed for lakes where renovation of the entire fishery is unfeasible. We strongly encourage predator stocking in conjunction with rough fish removal programs to fill the niche with desirable fish created by removing unwanted species. 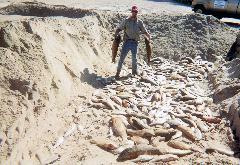 Lake Renovation: Chemical eradication of an entire fish community is a drastic but extremely effective method for getting rid of rough fish (undesirable species) and re-establishing a desirable fishery. Rotenone can be used to chemically eradicate existing fish populations. 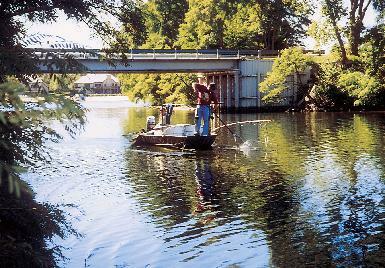 Usually within 2 to 4 weeks of renovation the lake can be re-stocked with desirable gamefish. Aeration Installations: We not only sell the best aeration equipment on the market, we also design, install, and service it! All of the aeration products available through Nebraska Lake Management are the best of the best when it comes to lake and pond aeration and will provide years of reliable operation. Chemical Treatments: We can set up a lake treatment program for controlling unwanted weeds and algae in your lake or pond. We are professionally trained and licensed to treat aquatic environments throughout Nebraska and Iowa and we stand behind our treatments! 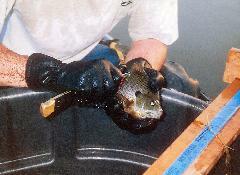 Fish Stocking: We can deliver fish from our hatchery directly to your lake or pond at an affordable price. We deliver throughout Nebraska and have the capacity to air-ship out of state orders. We have the highest standards for fish health in our facility and guarantee live healthy fish upon pick up or delivery! Water Quality Surveys: We can provide custom designed sampling programs targeted at answering water quality issues specific to a given lake or watershed. These surveys can be one-time sampling events or multiple sampling events depending on the issue being addressed. From dissolved oxygen and nutrients to bacteria and pesticides, we can help design a sampling protocol, take water samples, and provide sample analysis. Nutrient and Algae Monitoring: We can provide a detailed monitoring program on your lake for phosphorus and algae. Water and algae samples taken from your lake at different times throughout a growing season can provide useful information on nutrient loading and the potential for water quality problems. We can also test your lake water for toxins released from blue-green algae. Located just north of Lincoln Nebraska!